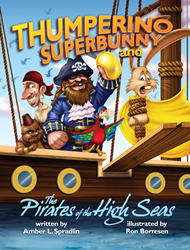 Thumperino Superbunny and the Pirates of the High Seas, the third installment in the children’s book series by award winning author Amber L. Spradlin hit the market this fall and has already reached the top three in US sales. Thumperino is assisted in this adventure by his best friend Veronica, a therapy rabbit who lives at the New York Public library. Together the two browse through all the wonderful books available at the library in order to prepare the Superbunny for his upcoming vacation to the Caribbean. Their quest for knowledge leads them to discover that there is a veterinary research school on the island, which may hold secret clues about Thumperino’s super-powers. Once he lands in the tropical paradise, Thumperino soon finds it’s not all fun in the sun. Someone is polluting the sea with garbage and it’s up to Thumperino Superbunny to get to the bottom of the mess. But his mission may be doomed when he unexpectedly tangles with a band of pirates. Will a surprising new super-power and the skills he learned at the library help him save the day or will he have to walk the plank? Amber L. Spradlin is the author and creator of the action hero series Thumperino Superbunny and the newly released You-Color-It Storybook A Cow Named Cow. Her works have won the Creative Child magazine Book of the Year, the Pacific Book Award, and the National Indie Excellence Award. Ms. Spradlin regularly presents author visits at libraries around the country where she reads live action segments of her books. She is a partner with the New York based theatrical production company G&W Entertainment, a member of Grammy (NARAS – National Academy of Recording Arts and Sciences), a graduate of the University of Washington School of Drama in Seattle, and was nominated for the Kennedy Center's Irene Ryan Acting Award. Thumperino Superbunny and the Pirate of the High Seas is available for purchase in paperback from bookstores everywhere, including Barnes & Noble and Amazon. It can also be downloaded as an eBook from top online sources, including the iBookstore. A portion of the proceeds from sales of all Ms. Spradlin’s books are donated to rabbit rescues and reading programs for children. Follow Thumperino Superbunny on Twitter @ThumperinoSuper or search Thumperino Superbunny on Facebook.